Happy Friday, friends! Remember that every Monday for the next few weeks, we’ll be doing #MeetMeMonday to introduce you to the team here at Element! 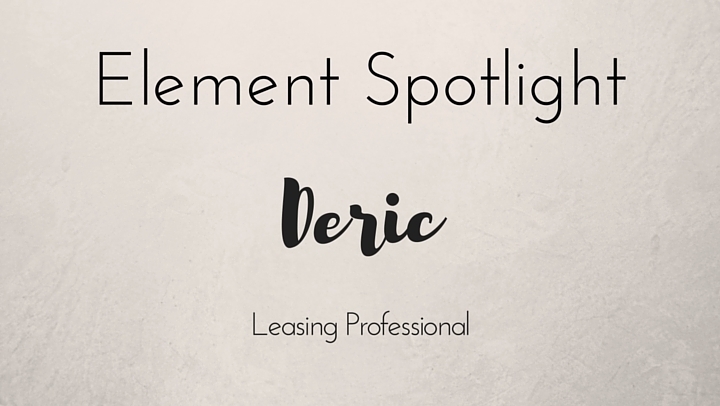 Last Monday, we introduced you to Deric, one of our Leasing Consultants, who also happens to double as a Fitness Trainer! Want to know more about Deric? So do we! Here's this week's #TeamTakeover, Deric edition! Chicken! I can’t live without chicken! Seven Pounds. Will Smith is my favorite actor! My mother, because she was victorious when circumstances seemed bad. Workout! I like arm day the best! Puerto Rico, the weather there is nice! Panera Bread, the Thai Chicken Salad is THE best!